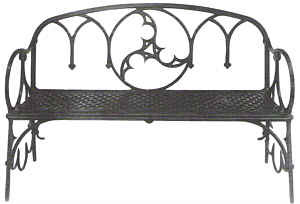 Art historian W.C. Aitken’s edification of wrought iron was based on the precepts of Art Nouveau, a movement hostile to industry, with Do place for manufacture within its strict tenets. Purveyors of cast iron countered that there was greater scope for individual craftsmanship at the design stage, fashioning molds and models in wood and clay. The debate was about process more than product, and centered on the broad definition of wrought, namely something “formed, fashioned, elaborated with care.”  Evidence of the hand as much as the brain was what Aitken and his colleagues lauded. In fact, it could be said that the entire history of metal furniture has been about mind over matter, the mastery of the materials’ traits, capacities and beauty. 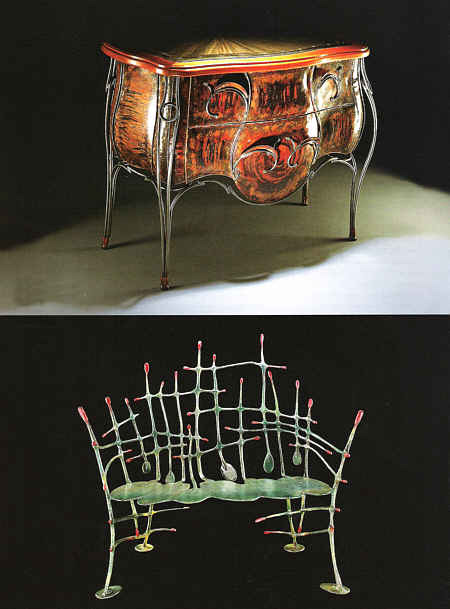 Georg Himmelheber’s 1996 Cast-Iron Furniture and All Other Forms of Iron Furniture provides excellent background to a discussion of contemporary metal furniture. His exhaustive gallery of European and American works begins with a piece of iron furniture cited as an ancient Roman sella curulis, a folding chair for persons of high rank. That it was made of iron is an indication of the value the Romans placed on the material. Further evidence of metal’s esteem in ancient times is that Hephaestus, the only craftmaking Greek god, was a smith. Whether Zeus and Hera were accommodated on Mount Olympus on metal folding chairs is not known, but these portable seats were produced throughout Europe until the end of the eighteenth century for religious and secular use. In the Middle Ages, chests of wood completely encased in wrought-iron panels were made for the protection of goods and documents against assault and fire; these were the precursors of modern safes. One such piece was the Domesday Chest, made at the beginning of the fifteenth century to house the 1086 Land Registry of England. Another significant metal furniture form was the bed, favored by kings and dignitaries. Iron deterred the ubiquitous bugs and moths that inhabited the damp and tapestrystrewn bedrooms, not only of the rich and famous. The more sanitary nature of metal, with its capacity for being washed and disinfected, determined its choice for hospital beds, and does to the present day. The first artist responsible for a piece of furniture constructed solely of cast iron may have been Karl Friedrich Schinkel of Berlin. A round three-legged table, dated 1820, with “lion’s paws [that] look like boots that have been pulled on, and… acanthus leaves like baggy trouser legs”  preceded the garden benches for which he became renowned. 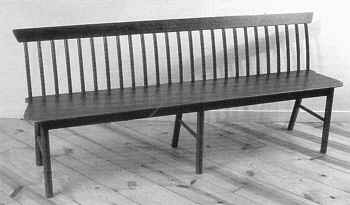 The “Schinkel bench” was copied in America , and inspired other designs as well, including one commissioned by Washington Irving in 1836, which had a seat of honeycomb pattern. In the 1830s, the increase in iron production for railways prompted wider use of iron for furniture and ornament, primarily for gardens. Unfortunately, few examples of the delicate yet strong neo-Gothic tracery from this period remain. At mid-century, nature became the predominant design motif, as branches and tendrils were thought to enhance the sitters’ enjoyment of gardens or park. In England , the iron industry was centered in and around Birmingham , where the Coalbrookedale Company copyrighted its designs for furniture. An 1847 Coalbrookedale ornamental chair was the “first step towards domesticating iron furniture,”  and, again, was readily copied by American firms. Significant advances in production occurred in the early nineteenth century that would secure the future of metal furniture. 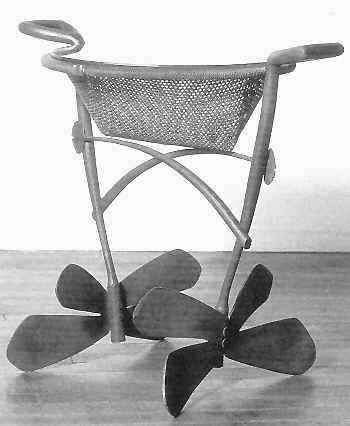 A bent-rod rocking chair first appeared in England in 1839; a U.S. patent for this form was granted in 1867. As earl), as 1829, a French company was manufacturing iron tubes, and in 1842, August Kitschelt opened his own factory in Vienna to make beds,tables, sofas and armchairs from iron tubes, in combination with upholstery. Another innovation was the use of thin wire: the ice cream parlor chair, from the late 1890s, was marketed in the thousands by the Royal Metal Manufacturing Company of Chicago . 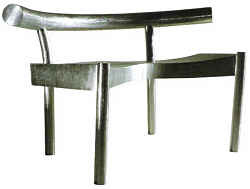 These designs were the precursors of tubular steel furniture in the twentieth century. A popular cast-iron piece of the early twentieth century was the school desk, most manufactured by the American School Furniture Company of Buffalo , New York . Church pews also incorporated cast-iron supports. Despite its appropriateness for certain applications, cast iron reached its peak of development before the onset of Art Nouveau; that movement’s disdain for mass manufacture contributed to its decline as a furniture component. The only significant works of cast iron in the Art Nouveau period were Hector Guimard’s Metro stations in Paris . It was not until the twentieth century that the use of metal was revived in the hands of designers Mart Stam, Marcel Breuer, and Ludwig Mies van der Robe. “Tubular steel furniture found its roots in the brave new world of modern art and architecture and the modernist preoccupation with the idea and image of the machine,” argues Christopher Wilk in Bent Wood and Metal Furniture. Marcel Breuer “as inspired be the strength, lightness, and functionality of his bicycle to consider the use of bent and welded metal in the design of a chair. In 1925, he introduced the prototype for the Wassily. His contemporaries exploited the properties of steel to design cantilevered chairs: Stam worked with pipes and pipe fittings, while van der Rohe used thin steel tubing. In 1929-30, van der Rohe’s Brno chair visually flattened the tubes into stainless steel bars. Eileen Gray adopted the metal ethic with a 1927 occasional table that combined chrome-plated tubular steel with painted metal sheet or glass. However, the major designers of the 1920s and ’30s moved on to explore other materials and it was not until Harry Bertoia’s and Charles Eames’s designs in the 1950s that metal components were respected, once again, in the contemporary furniture market. It is appropriate to segue. from a history lesson to the work of John Rais. Rais defines himself as a metalsmith, although he made his name as a blacksmith.’ This trade, with the horseshoe as its icon, seems a throwback to eras long past. Indeed, Rais worked as the “village blacksmith” at a living history museum while in college, so he is respectful of the tradition and its current masters. He updates past practices in his use of materials: mild steel in combination with forgeable titanium, bronze, copper, brass and aluminum. Rais obtained his MFA from Cranbrook Academy of Art. In addition to honing his precision, be absorbed the architecture and three-dimensional design that permeates the Bloomfield Hills campus. Rais divides his output between vessels and architectural work. Some of the vessels are quick studies that have a sense of function, yet take a form not normally associated with that function; they provide an opportunity for experimentation that can be applied to works of larger scale. Rais says, “I make the objects that I wish I could find”, and this raison d’etre permits him ample leeway to experiment with design and materials. He describes some of his creations as “fictional tools.” One recent work, Basket Table, implies functions that go beyond hosting objects on its planar surface. It is a quirky piece of furniture that might ordinarily be dismissed as just plain peculiar, yet its patina suggests it is an artifact, recently unearthed, crafted over time by a resourceful ancestor. Rais’s architectural work includes fire screens reminiscent of the oeuvre of Charles Rennie Mackintosh. These pieces permit copious opportunity for indulging in bas relief sculpture, and while their function is seasonal, their scrutiny year-round demands a considered arrangement of the components. Advancements in the mills and factories, once scorned by Art Nouveau, have enabled contemporary studio artists to work as designer-makers in the production of metal furnishings. Artist Jim Rose is also inspired by historical precedents, not in the realm of metal but in the tradition of American furniture making. After a trip to Shaker museums and settlements in New Lebanon and Old Chatham, New York and Hancock , Massachusetts , Rose embarked on a comprehensive replication of Shaker furnishings in steel. Thus far he has handcrafted over 130 pieces, including case goods, benches, chairs and clocks; his most recent project is recreating the familiar oval boxes out of found painted steel. The steel for all his work is salvaged from scrap yards and brushed and waxed so that the natural patinas allude to the aged wood of authentic Shaker works. The pieces are simply and cleanly defined and intended for practical daily use as were their predecessors. Rose is conscious of his appropriation of a coveted design aesthetic, but believes that his interpretations are respectful and celebratory of their origins. He continues to research the religious underpinnings of Shaker furniture, and hopes to document this body of work in a book as a homage to this powerful genre. The work of Evan Lewis travels further back into the cobwebs of the furniture history attic. His Copper Bombe Chest of 1994 is inspired by a Louis XV bombe’ commode, a chest of drawers with outward-curving front and sides. Its structure is of steel tracery, to ensure that the fluidity of the original has not been lost. The body of the commode is patinated copper and the top is steel set in a mahogany surround. Lewis pays particular attention to die patinas on the copper, to imply the marquetry and lacquered surfaces of the Louis XV period. Lewis’s method of drawer construction recalls the wood and metal chests from the Middle Ages that were intended for the storage of precious goods; he incorporates mahogany boxes within the copper to house the owner’s treasures. Lewis gained his knowledge of modernism at the School of the Art Institute of Chicago; his predilection for European decorative arts was fostered during travels after graduation. 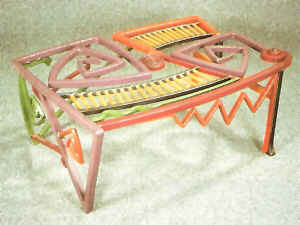 He indulges the spare aesthetic of modernism in his kinetic outdoor sculptures, which have been shown nationally; his furniture, on the other hand, is a chance to play with color, pattern, and surface decoration- Lewis began as a woodworker; hence, the complementary marriage of wood and metal in many of his pieces. This rich background ensures that he has fertile territory to explore as be continues to combine past and present. Joseph and Georgia Pozycinski combine forces to create sculpture and furnishings that hearken back to the naturalism of mid-nineteenth century garden furniture. Georgia has a background in zoology and pottery and is responsible for the finely detailed sea and land creatures and flora that are integrated into her husband’s hammered, welded, and pressed forms. They work primarily in bronze, with the addition of steel as desired. Nest Cabinet has legs made from bonded sand molds cast from real sticks; the cabinet element is crafted of pounded and bent sheet silicon bronze that has been given a translucent hot patina and three coats of Renaissance wax. The cabinet was inspired by the crows that live in a neighboring forest, and houses natural treasures from Georgia ‘s imagination. But there is room, too, to permit the owner to store small, precious objects. The function of this piece of furniture is to simply enhance a room by bringing the outdoors in. Unlike artists who must rely on outside contractors to supply cast elements, the Pozycinskis put together a sculpture studio at moderate cost by scrounging equipment from high schools that were abandoning metal programs. Joseph can fabricate each component according to his schedule and standard, and considers the details of his business transactions–like meeting delivery deadIines – as important as the bird beaks and crab claws that grace his sculpture. Paul Freundt’s work has been acquired by individuals as contemporary as Ted Turner and Elton John. He concentrates on seating and tables that take advantage of hollow construction in combination with formed and welded sheet metal. His materials of choice are steel, bronze, stainless steel and aluminum, whose surface texture and depth can be manipulated by a variety of meas-patination, grinding, brushing. Freundt began as a sculptor, with an MFA from Georgia State University , and it is clear that his references are abstract, minimalist, lyrical, and kinetic. His love seats, chaises, and occasional chairs have the energy of a haphazard accretion of elements, which belie the ergonomics essential to their assemblage. Freundt tests his forms throughout the manufacturing process to ensure that the human body is well accommodated. And while Freundt’s work might support the derriere of a rock musician, it is also part of the collection of the Renwick Gallery of the Smithsonian Museum. Furniture makes a statement, has presence and requires interaction: precisely why Gary Magakis progressed from making fashion accessories (belts, buckles, and jewelry) and table-top items to larger-scale sculpture to live with. Using techniques he learned more than 20 years ago on shop floors and factories, Magakis collaborates with his wife Carol, an architectural designer, to realize tables, benches, cabinets, and amps, The husband-and-wife team is joined by their son, Eric, a graduate Of Tyler School of Art in ceramics and a bluegrass musician, who does most of the welding. 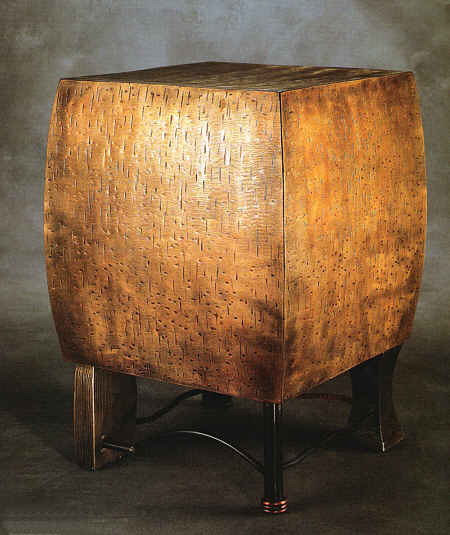 The output of their studio in central Philadelphia has a consistency of aesthetic that almost demands that the pieces have companions rather than stand alone; Bronze Cube Table seems meant to coexist with of their limited-edition floor lamps, the svelte lamp providing contrast to the Table’s convex volume. Both objects are fabricated of bronze, steel, and copper. The pitted surface of Table speaks of age and use, much as an old butcher block honors its purpose and time on the job; the asymmetrical legs are a signature of the Magakis studio. Their portfolio also includes a bronze bench meant for outdoors: they have exploited the versatility of metal much like Karl Friedrich Schinkel in 1825. Whereas the Magakis bench is linear and ground-hugging, Scan Calyer’s works are characteristically dramatic, commanding the space around them. Calyer apprenticed with both Albert Paley and George Rickey: from the former he gained his design aesthetic; from the latter be acquired technical expertise and a willingness to try the untried. He welds and grinds sheet bronze, steel, and stainless steel into volumetric structures and often combines it with drum-taut rich leather upholstery. The marriage of tone, texture, and temperature is unfailingly sensual. However, Calyer’s Self Portrait of the Artist as a Bench has a different energy, based on broken tracery, color, and asymmetry. Its skeletal configuration reveals a barebones honesty about how the artist sees himself. Since this piece of furniture is a departure from Calyer’s earlier work, he should be applauded for experimenting with materials and narrative content. Dale Wedig considers “blacksmith” to be “too big a title” to adopt. He performs all of the requisite functions of a smith, yet is one of the most eclectic purveyors of the craft this side of Mount Olympus . Wedig’s work ranges from small cast bronze anvil pins to multi-ton sculptures, as well as furniture Which combines found elements. Wedig’s ability to integrate seemingly disparate components into an object that also looks found, but found in its entirety, is witness to his imagination, sense of humor, and consummate skill. Zig Table Bench is a playful sketch of curved and angled broad lines; the application of lacquer separates the segments so that each one stands out yet harmonizes with the whole. Some of his furniture has the patina of time or the residue of original paint; other objects are more naturally finished so that form takes precedence and texture interests the eye. The assurance with which juxtaposition, complementarity, and contrast are handled in Wedig’s furniture assemblages makes them welcome in the most sophisticated environments. Wedig is a professor of metalsmithing and sculpture at Northern Michigan University , and his work emanates from the studio there. He eschews high-tech methods, such as a gas furnace, and relies upon coke (as in refined coal) and hammer and anvil to execute his commissions and gallery pieces. His process might be considered old-fashioned, but it accounts for his need for physical activity and preference for tradition. Wedig is the quintessential Hephaestus, pounding away in his smoky forge. The journey from a 250 A.D. iron chair to these twenty-first-century Vulcans is an abridged testament to the vital genre of metal studio furniture. This brief survey is also an indication that mind and matter must coexist in art and craft. Even W.C. Aitken would be persuaded.